Windows programming is faster and easier than you ever imagined, with the insider tips, techniques, and shortcuts you'll find in Borland C++ Insider. Acclaimed the premiere Windows programming environment by enthusiastic critics worldwide, Borland C++ represents an evolutionary leap in Windows programming. Now Borland C++ Insider tells you how to get the most out of the latest version 4.0 of this versatile new IDE. Written by an author who has worked with Microsoft Windows since version 1.0 and who helped beta-test the latest version of Borland C++, it supplies you with a gold mine of insider tips, secrets, shortcuts, tricks of the trade and, of course, all the step-by-step hands-on guidance you need to create sharp, extremely usable Windows applications more quickly and with less effort than ever before. 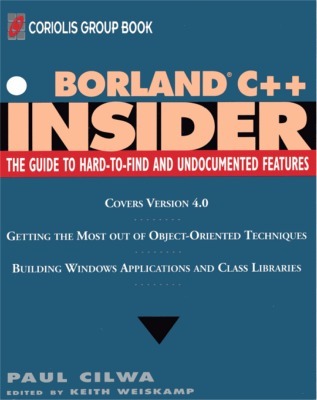 Borland C++ Insider was my second book contract but was actually published third, at a time when the version I wrote about was already obsolete by the time the book reached the shelves, meaning it did not sell well even though the book itself was pretty good, presenting object-oriented programming techniques as applied to C++, a language written specifically for object-oriented programming. And even though the examples still worked in the newer version, no one was interested in buying a book for an old version of the development environment. Borland C++ Insider did not come with a floppy disk, which probably also didn't help sales. Instead, the examples were posted on Coriolis' web site. (Or maybe it was Wiley & Sons' web site.) In any case, that source is no longer available so, on the off-chance that someone still needs these files, you can download them from here is the code this link.